When the two of us, who were classmates and dorm mates at Princeton, came to MIT in 1965, we were joined by two other Princeton classmates, Mike Newlon (also a dorm mate) and Charlie Emerson. 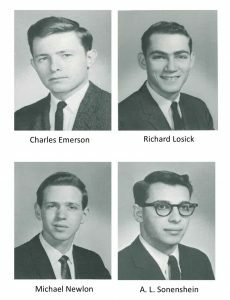 As a result, our Princeton class produced four of the 20 students who formed the entering class of 1965 of the MIT Biology Graduate Program. (The class was originally meant to include 21 students, but one of the accepted students, the recent Nobel Prize recipient Michael Rosbash, decided to spend a year at the Pasteur Institute before joining the MIT program.) Initially, we roomed together with Mike in Porter Square with a fourth member of our class, Ray White. As PhD students, we worked in the labs of Phillip Robbins (Rich), Salvador Luria (Linc and Mike), and Maury Fox (Ray); Charlie moved to UCSD to finish his degree. Back then the Luria and Robbins labs were located in Buildings 56 and 16. (Why does MIT use numbers rather than names for their buildings?) The department consisted of semi-independent sub-departments of Biochemistry, Microbiology, and Biophysics. All of us eventually became faculty members at various universities: Rich at Harvard, Linc at Tufts Medical School, Mike at Rutgers, Ray at UMass, Utah, and UCSF, and Charlie at UMass Medical School. At Princeton, Rich had done thesis research in the lab of Charles Gilvarg, studying the synthesis of lysine oligopeptides in E. coli; Mike and Linc worked in the lab of Donald Helinski on the genetics of colicin synthesis. Our backgrounds in microbiology research served as inducements to continue studying microbes at MIT and throughout our careers. Indeed, Linc’s PhD thesis research with Luria on the bacterium Bacillus subtilis and its ability to produce spores sparked a collaboration with Rich that greatly influenced both their subsequent careers. 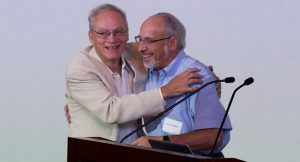 Yet another lifelong collaboration emerged when Linc married another member of our class, Gail Entner, who worked with Ned Holt and went on to become a professor at Boston University Medical School and Tufts Medical School. Mike Newlon also married a classmate, Carol Shaw, who was also in the Holt lab and has been a professor at the University of Iowa and Rutgers Medical School. Linc and Rich are proud to have trained many students (six of whom went on to be postdocs at MIT) and multiple postdocs who have continued productive careers in their own labs based on our beloved B. subtilis bacterium. Indeed one such individual went on to become the chairman of the very department for which we have written these recollections. Memories fade with time, but we have recreated at least a partial list of the entering class of 1965 and their mentors. Steven Raymond (J. Lettvin) MIT, Harvard Medical School, Personal Health Technologies, Inc.